Bollard Covers - Ribbed - Nine Colors 4, 6 & 8 inch ribbed bollard covers. Description: These bollard covers are ribbed to provide extra protection against impacts. Available to to protect 4", 6" and 8" posts. Our bollard covers are 56" long in all sizes and colors. Yellow 6" and 8" posts available in 72" lengths. Choose yellow, red, lime, green, handicap blue, orange white and black. Can be trimmed easily for an exact fit. Uses: Use these bollard covers over all of the bollards you have on your property. They eliminate the cost of paint and maintenance labor to repaint. Protect vehicles and posts from damage. 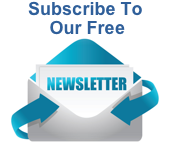 Description: The new smooth post sleeves will fit 4", 6" and 8" posts and are available in 56" lengths. Order in red or yellow only. Made of high visibility, HDPE construction with UV inhibitors that resist fading, rusting or cracking just like the ribbed bollard covers. Can be trimmed for exact fit. Uses: Use these smooth post sleeves on all of your posts. They will eliminate the cost of painting and protect vehicles and posts from damage. 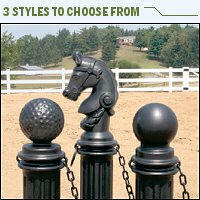 Description: Decorative bollards that look like cast iron but are lightweight. Durable because they are made of high density polyethylene. Resistant to UV rays, weather, chemicals, cracks and dents. Three styles to choose from: Golf Traditions, Hitching Post or Classic. Easy installation. Maintenance free. Uses: Dozens of uses including walks, driveways, gardens, malls, arenas, show facilities, schools, equestrian centers, barns, historical buildings, etc. Use to mark boundaries, to control vehicular and human traffic, to add value to any building or to improve the landscape of your property.